Recently I came across a worked example which exemplified the power of investing early. It compared one investor who put away £2,000 per year between the ages of 19 and 25 then nothing after, and another who put away the same £2,000 each year from 26 to 65. Surprisingly, the younger investor generated more in interest by the age of 65 than the late starter! It’s never too early to start saving for your future, and later in this post I’ll introduce you to Lewys, who is a prime example of someone who is off to a flying start. Before getting to the interview with Lewys, I want to introduce you to a tool which shows you the power of compounding interest and starting your investment journey early. 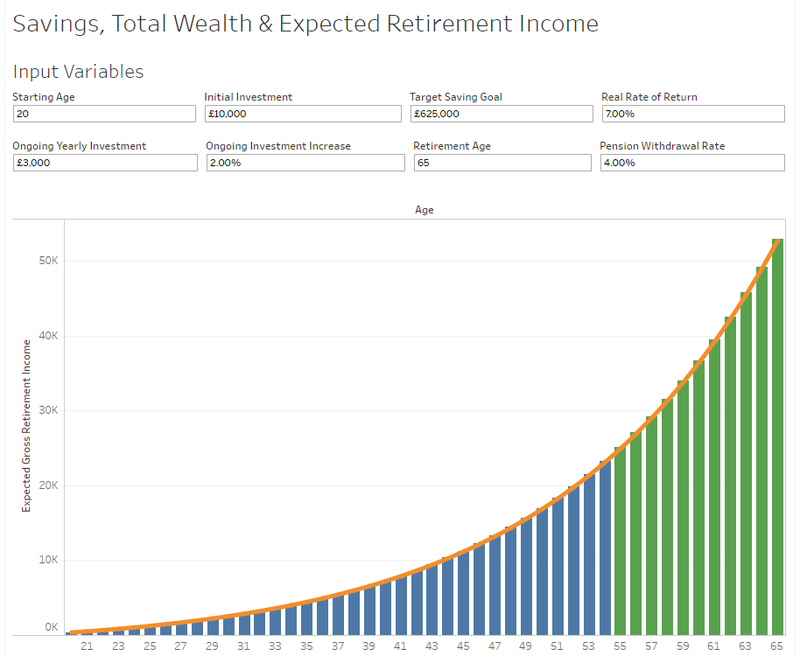 This calculator lets you experiment with different input variables to see how long it would take you to meet your goals for retirement. In the initial example above, a retirement income of £25,000 is reached by the age of 55. I first spoke to Lewys after publishing my review on Moneyfarm vs TD Direct Investing. Lewys runs an investing blog called Frugal Student, where he talks about his journey to save and invest on a student budget whilst hoping to retire by 40. Lewys had written a similar post to my Moneyfarm review but looking at Nutmeg: another competitor in the robo-advice market. I had a read of his blog and thought it would be a great idea to ask him a few questions to share his enthusiasm and experiences as a student investor. What first motivated you to take such an active interest in saving/investing? I was 14 years old when the financial crisis hit in 2008. I saw friend’s parents losing jobs, doom and gloom on the news and I’ll never forget seeing people queuing to get their money out of Northern Rock. Interest rates tumbled and when I got my first part time job at 16 years old I managed to save £1,000 in a year and was so disappointed at the pennies I was getting in interest. At 18 years old I plunged head first into stocks and shares not knowing what I was doing and quickly lost money. It’s from there that I learnt about dividend growth investing and the slow and steady accumulation of wealth. What tips would you give to other young people who want to do something similar, but feel overloaded with the options and information out there? Read, read and read some more. I’ve read around a dozen books on investing and I’m still learning. The most important thing is to disregard all binary trading and forex options. This isn’t investing and you’re most probably going to lose a lot of money. “Time in the market beats timing the market.” Invest into large global companies young, hold forever and you wont go far wrong. “Investment portfolios are like bars of soap. The more you handle them the smaller they get”. If a stock drops 50% that doesn’t mean you should sell it. Be passive in your approach and don’t handle too much. Set up a monthly investment option in some top notch companies and let compounding do its thing! I see on your blog that you have the ambitious target to retire by 40! How did you come up with this target? The life expectancy in the UK is currently 81.5 years. I want to live at least half of that. I used to work in a hospital handing out food and met so many terminally ill people just a few years into retirement. That doesn’t seem fair to me. 40 years of freedom is a much fairer deal and I’ll spend every second doing the things I love. Do you think that young people are more open to newer Fintech investment platforms, such as robo-advisors, peer to peer lending or crowdfunding? Absolutely. I wrote this Nutmeg investment review describing how one of the most popular UK robo-advisors work. No more complicated graphs. No more difficult decisions just monthly investments – just like a savings account! Peer to peer is the first option I cover in my guide, ‘Where to invest money in 2017’ and from what I see at least two out of the three main platforms are safe bets as they have large backup funds to cover bad debts. Peer to Peer is an amazing way to earn interest on your money with little risk. I have a RateSetter account and love it! Also, many platforms now have easy to use apps to make things even more accessible. There really is no excuse not to invest! For people who have not come across the concept of ‘FIRE’ (Financial Independence Retire Early), how would you describe it to them? To me FIRE is a formula to live more of your life. People always want to have more time. How many times have you said “I don’t have time for that” or “I’ve got work in the morning, I can’t”? Imagine freeing up all the hours you work and replacing them with doing things you love. Spend less time working and let accumulated money work for you. Moving to London and buying a house used to be the fast track to financial independence for many graduates. Do you think that priorities have changed for young people now that prices have become so unaffordable? There’s an obsession with owning a house in the UK and I think it’s misplaced. We don’t have to own a house. Ever. There are countless liabilities that come with owning a house such as expensive repairs, boiler replacements and even flood damage. These events can really dent your available capital. By renting – this is all the landlord’s problem and you’re unlikely to have to come up with large sums of cash for unexpected events. Countless people end up taking out loans for home improvements and essential repairs and debt will only delay your FIRE journey. Personally, my priority is to be free, have no fixed assets to worry about and to live in different parts of the world, renting, on my constant stream of dividend income. Being tied to a massive mortgage isn’t really appealing to me. For those who do want to own a home though, I agree things have gotten way out of hand. I’m really glad to see the government taking action on buy to let that has really inflated property prices and more needs to be done to help young people. The buy to let ISA doesn’t even come close as the 25% the government chips in can’t be used towards the house deposit. Instead, it’s paid after the completion of the purchase. What a joke! The concept of FIRE is just something I’ve only come across over the last couple of years, but it’s easy to see why it’s so appealing. For young people who start with the right ideas to live frugally and invest, it can have a dramatic impact on the health of their future finances. under mines it as without private landlords to rent them the properties they will have no where to live, All the Government interference with the market place has achieved is to unfairly tilt the playing field to the benefit the large corporate landlords at the expense of the small “retirement portfolio” investor without achieving their intended goal. And from my own experience of dealing with their like when I was a student, good luck with getting anything out of an impersonal corporate landlord that costs money! I agree with you that small time private landlords have been disproportionately penalised with the changes and it would be better to see the tax system deal with it in a more considered and consistent way. Having rented from both I would much rather deal directly with a small-time local landlord. My absolute worst was a Russian portfolio landlord who didn’t like to play by the rules of their own contract and was really aggressive. Maybe I can provide some clarity on my answer here. The reason I’m glad to see the government tackling buy to let is because of the over-inflation of the housing market which I would argue pushes out small time investors just as much as the cuts to tax relief. These changes disproprtionately affect higher rate tax payers cutting the amount of mortgae interest that can ofset against rental income. The new maximum is a 20% relief from 2020 as opposed to 45%. I would argue these changes are leveling the playing field and giving the small guy a chance to buy a property at a fairer price. I think what Shaun meant was to compare the smaller time private landlords (both 20% and 40-45% taxpayers) against the larger multi-property landlords or corporates who operate through a limited company and can still offset 100% of their mortgage interest against income. Perhaps through oversight of the government, a loophole now for higher rate tax payers is to pay an accountant ~£70 a month to set them up an SPV limited company and transfer their property into it. Then they can claim 100% of the mortgage as a business expense, and perhaps their accountant will find a few inventive ways to add further business expenses (e.g. share of personal house as home office, annual Christmas meal for directors up to £100, transport to/from the property).